On January 5, 2008, IZA Director Klaus F. Zimmermann presented the second IZA Young Labor Economist Award to Oriana Bandiera (London School of Economics), Iwan Barankay (University of Warwick) and Imran Rasul (University College London) during an IZA reception held at the Annual Meetings of the Allied Social Science Associations (ASSA) in New Orleans. 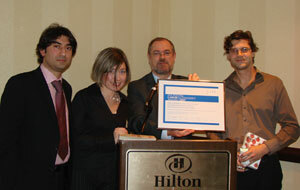 The award honors an outstanding paper published by young labor economists under the age of 40. The selection committee – consisting of Zimmermann and the six IZA Program Directors – chose their joint paper "Social Preferences and the Response to Incentives: Evidence from Personnel Data" (Quarterly Journal of Economics, 2005) from a large number of nominations submitted by IZA Research Fellows. During the award ceremony, Zimmermann said the selection committee was impressed with the "originality of the research approach, the methodological rigor and the thorough analysis of the data" in the prize-winning paper, which has important implications for the design of incentive schemes: Analyzing personnel data from a UK farm, the authors found that due to the workers' social preferences their daily productivity was at least 50% higher under piece rates compared to relative performance incentives. In his acceptance speech, Barankay thanked the community of labor economists for nominating the paper, as well as the "142 fruit pickers without whom our research would not have been possible."